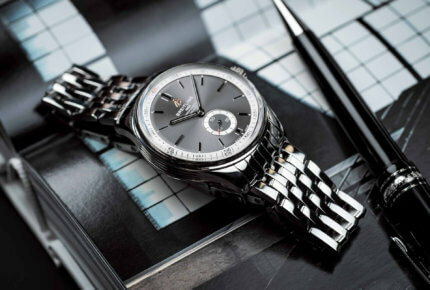 Well-known for its aviator and diver’s watches, Breitling is reintroducing the Premier, an elegantly stylish line to be worn on land that first appeared in the 1940s, as a complement to the brand’s more sporty tool watches. Breitling Chief Executive Georges Kern was in Paris earlier this month to present a new range, and to outline the strategy now being implemented. First off, he announced the brand will simplify its offering by reducing the number of references from 650 to 120, and cutting the number of lines from 12 to seven. 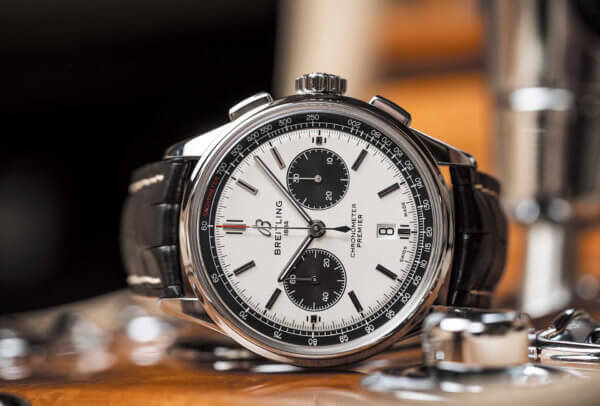 The Breitling for Bentley line disappears and will be integrated into existing Breitling core product families to celebrate the ongoing partnership. In addition to the permanent collections, “talking pieces” such as the new Aviator Curtiss Warhawk B01 Chronograph will be periodically introduced. As for products, among the new releases presented at Baselworld 2018 and now being delivered, the Navitimer 1 Automatic 38, the first three-hander in this collection, is selling well while the Superocean Heritage Collection is “going through the roof,” says Kern, adding that “we’ve stopped quartz which doesn’t match our image, but we will continue with electronic professional watches.” A new corporate ID has been rolled out to reflect the new strategy. Boutiques are more casual, with pool tables, motorbikes and surfboards mixed in with the watches. The first of these new-look stores have already opened in Dubai, Zurich, Beijing and Houston, with Las Vegas next on the list and many more to come around the globe. Breitling has also signed a contract with two ecologically-concerned organizations. One, Outerknown, is a sustainable apparel manufacturer co-founded by Surfer Squad member Kelly Slater. Breitling and Outerknown have recently released the Superocean Heritage Outerknown with a strap made out of ECONYL® recycled nylon drawn from fishing nets. The material provides interesting strap alternatives for the Superocean Collection as well as for the packaging. “Stay tuned,” declared the Breitling CEO. 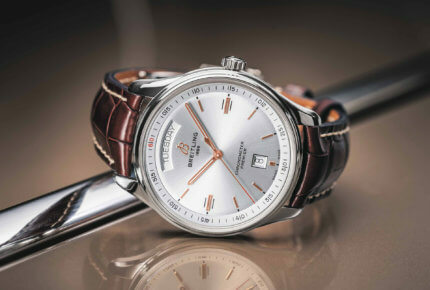 The new Premier line, inspired by the original design of the 1940s, is dedicated to everyday elegance. 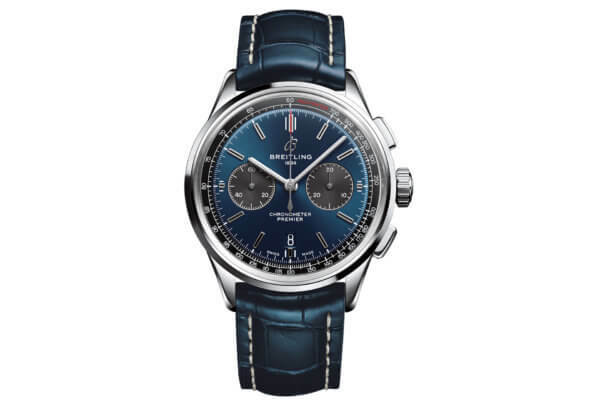 It consists of five distinct models that include chronographs, a day-date and a three-hander with small seconds. 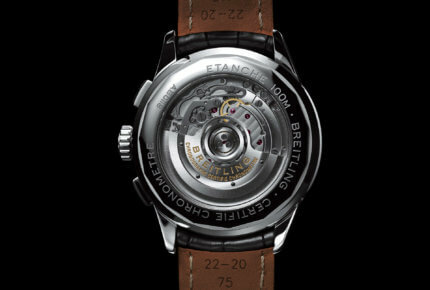 All are presented in stainless steel cases with a 40mm diameter (42mm for the chronos) and 100-metre water resistance. Depending on the model, dials can be silver, black, anthracite grey or – because “blue is the new black” says Kern – a superb deep blue. 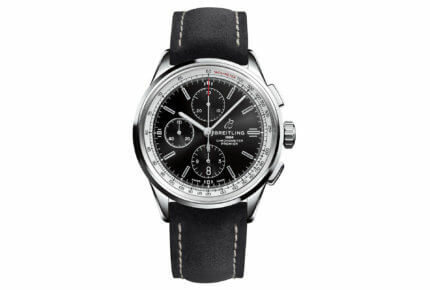 There are also two styles of “panda” dial for the Premier B01 Chronograph 42 driven by the B01 in-house movement. The stainless steel cases are complemented with stainless steel bracelets or by nubuck or alligator leather straps. The movements are all mechanical automatic. In addition to the B01 and its 70 hours of power reserve, the second chronograph in the line, the Premier Chronograph 42, is equipped with Breitling Calibre 13 for 48 hours of reserve; the three-hand model, the Premier Automatic 40, features Breitling Calibre 37 while the Premier Automatic Day & Date runs on Breitling Calibre 46. 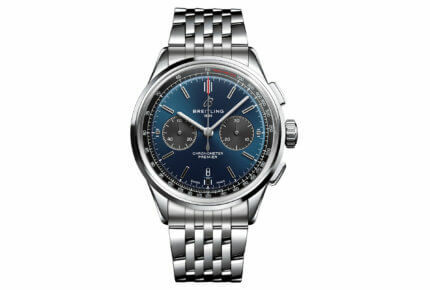 All have screwed solid stainless steel casebacks, with the exception of the flagship Premier B01 Chronograph 42 which features a sapphire caseback for an impressive view of the movement. 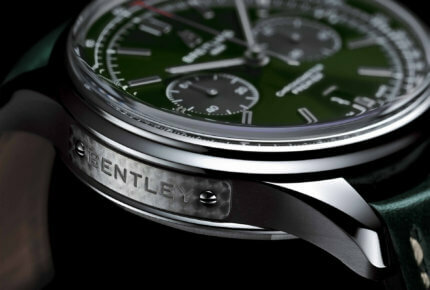 The fifth model is the Premier B01 Chronograph 42 Bentley British Racing Green. 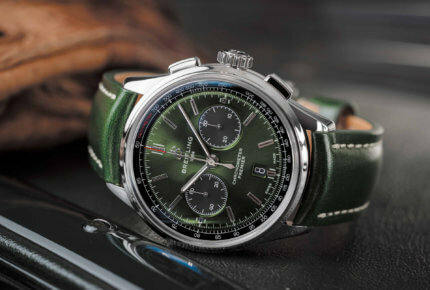 Equipped with all the technical features of the Premier B01 Chronograph 42, it boasts a striking British Racing Green colour on the dial. 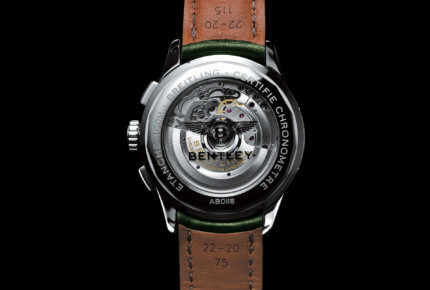 A plate engraved with “Bentley” is screwed to the left side of the case, and the transparent caseback is enhanced with a metalized Bentley logo. 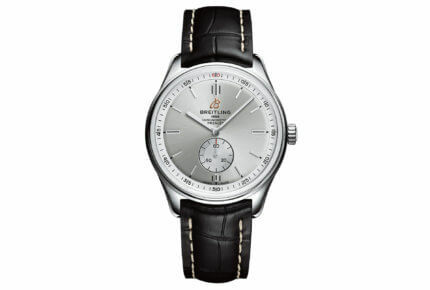 The model is complemented with a stainless steel bracelet or a green leather strap.